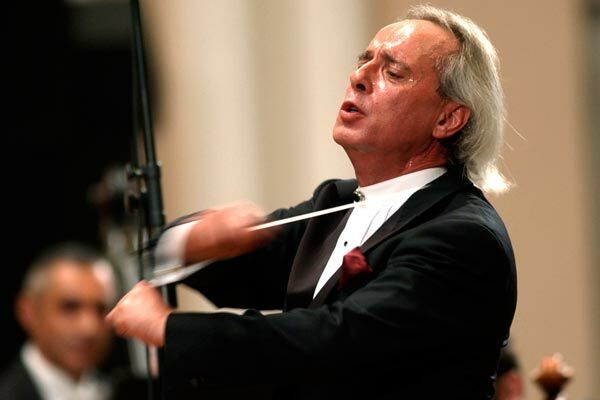 The Zhejiang Symphony Orchestra announced that internationally acclaimed Armenian conductor Aram Gharabekian will lead the orchestra in a major collaborative concert on October 13 at the Hangzhou Theater in Hangzhou, China. Gharabekian is former artistic director and conductor of the National Chamber Orchestra of Armenia, who resigned last winter. He left following a dispute after orchestra members complained to the Ministry of Culture because Gharabekian wanted to hold auditions for places in the orchestra, following a common practice for keeping the body fresh. The maestro had led the NCOA for 12 years. He is currently planning to establish a new foundation dedicated to international artistic collaboration through music as well as an array of music-education and mentorship programs. Next month’s concert will mark a return to China for Gharabekian. In 1999 he conducted the same orchestra in Beethoven’s 9th Symphony in the “Millennium Celebration Concert”. Gharabekian is the recipient of several prestigious awards, including the Lucien Wulsin Performance Award, the ASCAP Award, the Harvard Musical Association’s Best Performance Award, and the Movses Khorenatsi Medal, bestowed by the president of the Republic of Armenia for his contributions to the arts.